Do you already have plans for Golden Week? I am going to visit Hiroshima again and I am really looking forward to it! We are staying at my boyfriend's Mom's house and I really really love this small house of hers. It looks a little old and shabby and inside it's quite narrow. But that's what reminds me of my childhood and my family. The atmosphere there makes me feel as I had been travelling back into the past and relive my childhood. Do you sometimes have such kind of feeling. Like a desire for reliving your childhood and doing tricks to your parents and neighbours again? We sometimes did really bad tricks, like hiding a hedgehog in our grandparents' closet or drumming on a cooking pot's back with a wooden spoon early in the morning! It's so nostalgic! Anyway, I wish you nice holidays!! Lately I have been enjoying the hot weather here in sapporo (at last). I have dug my bicycle out of the snow and have been riding around town on it everyday. I find it to be both fun and good for me. I'm going back to england in July and I'm trying to make the most of my time here in sapporo so I like to keep busy everyday. I have also been learning shakuhachi and its a lot of fun, although a little difficult. I want to be able to play some traditional Japanese music eventually. Anyway I hope to see you all at the party on Saturday 23rd. The last one was really good. Finally, some decent weather, hope you’re all enjoying it! With the nice weather I decided it was time to purchase a bike. Best investment I’ve made all year (Yeah okay, I realize it’s only been 4 months..). I can get to work in half the time it would have taken me before. Yesterday I was biking home when I was stopped by a police officer. He asked me to take off my headphones. I thought it was sort of an odd thing to stop someone for, but I complied. I was getting ready to peddle on when he asked my name and then how to spell it. Next thing I know he takes out a pen and writes my name down in his pocket book. Then he turned back around and waved me off. I’m not sure what that means. Maybe my name is now on the list of dangerous foreigners? Probably not, but it was strange! One last thing: Last Friday, April 8th, I came into Chit Chat Cafe to work the opening shift and was immediately confronted by a camera crew. It turns out they were from HBC and wanted to film some conversations of Japanese people speaking to foreigners. They also interviewed James and Yuka as well as some customers. It will be aired on April 13th, today, on Channel 1, sometime between 3-5 pm. I hope you all get a chance to check it out! Well, this spring vacation was an interesting one for me, though it was not like a vacation at all＾＾　I went to a Central Asian country called Tajikistan (u can take a quick look at a map) on my fieldwork, let’s say a small research (I hope it was so...). I spent over there more than a month, enjoying local delicious food (plov, mantu, lagman, etc. 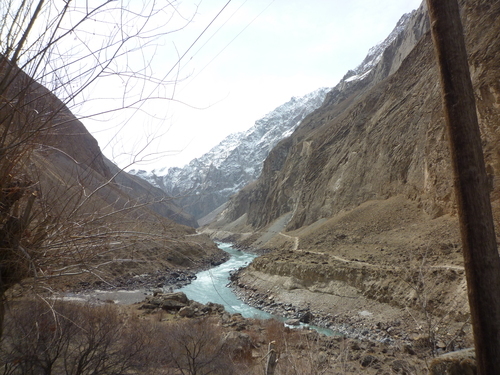 ), landscapes of the Pamirs (go to Wikipedia if you don’t know much about this part of the world! ), talking in Russian (yatta! )..., though I was a bit busy with interviews&collecting data in libraries. The one thing I really hated was the weather. I expected to have very sunny, warm and ‘dry’ days, but mostly it was snowing and then melting, sometimes raining. If you ask about the research results, well, they do not satisfy my expectations. But, I could meet and talk with the political party leaders (oppositionists), officials, experts, and even asked to give a lecture to the Slavic university students (it was really enjoyable). And my worst memory is that it was just like a torture to work at the library where it was always so cold. I felt sorry for the stuff who work there in winter time with no heating. 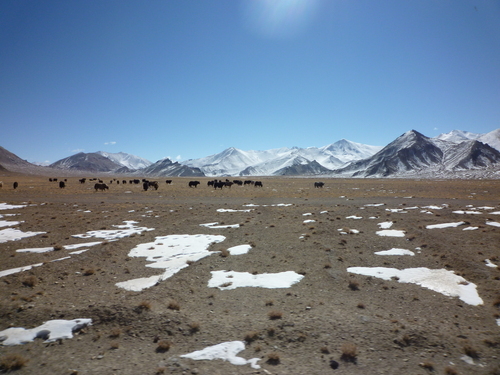 I know some of you guys are really interested in my research so we can talk about it later in details＾＾But here, I would like to share with the impression of my trip to the Pamirs. If you looked at map, you already know that the Pamirs lie at the mountainous heart of Asia, and I would say in addition, that 93% of the Tajikistan territory consists of mountains. The Pamirs are also called as the roof of the world, and it was an intersection spot of the British, Russian and Chinese Empires, later their Central Asian diplomacy has been known as the Great Game. Pamirians are very open and kind people, and I would say pure and naive to some extent. Most Pamiri people are Ismaili Muslims (Shiit Muslims), they speak their native languages which are totally different from the Tajik language. Even in towns it seems like their relations are close to the community relations, they help each other in difficulties (e.g. funerals). I always appreciate the Central Asian hospitality, and this time could fully enjoy how the Pamirians treat their guests. By a lucky chance, I was invited to one pamiri house by a stranger (a Pamirian girl with the very beautiful black eyes) and stayed with her family for a couple of days. It was a lucky chance not only because I did know where to go at 2.30am after arriving in a new and completely unfamiliar place, but because I had a chance to know what is a pamirian family. I saw their traditional house, drunk their salty milk tea ‘shir-chai’, saw the way of praying, knew a lot of new and interesting things which probably I would not find in a book. Indeed, it was a great experience I will never forget! Assel (Kazakhstan) The Panj River forms a natural border between Tajikistan and Afghanistan.